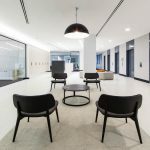 IA Design were appointed by global accounting firm, Moore Stephens, to design and refurbish their new Perth head office. The brief called for a vibrant work environment that inspired staff belonging and pride, and encouraged communication and connectivity. In response to Moore Stephens’ direction, the fitout was to accommodate 15 enclosed offices, 90 workstations, meeting rooms, collaboration spaces, utilities, print hubs, quiet rooms and staff breakout areas. The goal was to create a friendly and professional workspace that was conducive to teams and individuals producing high-quality, efficient outcomes. The design palette combines Scandinavian simplicity together with hints of branded colour to bring a warm and welcoming character to the space. The space was strategically designed to maximise natural light penetration, with open plan workstations set around the perimeter of the floor plate. 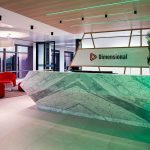 The end result was a contemporary fit-out that provided ample opportunity for natural staff connection and communication. Moore Stephens were extremely pleased with the outcome.